Home / aurora borealis / europe / finland / He Left His Camera Pointed At The Sky. 8 Hours Later… I’m In Awe. He Left His Camera Pointed At The Sky. 8 Hours Later… I’m In Awe. There are some parts of the world that are so magical and surreal, it feels they came from a storybook page. Inari in Lapland, Finland is that rare and breathtaking location where the sun shines 24 hours a day in the summer and is in complete darkness in the winter months. The dark nights allow for the Aurora Borealis to display a spectacular light show. The northern lights are the result of collisions of gaseous particles in the earth’s atmosphere with the charged particles from the sun. The waves of light vary in color from green, purple, and reds. The Aurora Borealis is visible in Lapland about 200 nights a year, usually from late August to April. 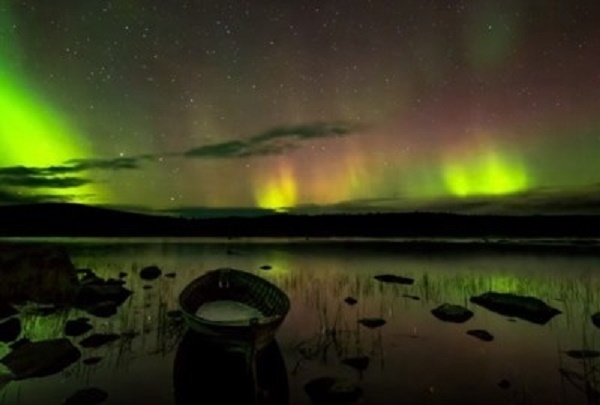 This time-lapse video was shot in Inari, a small village located only 300 kilometers form the Arctic Circle. Unlike the rest of Lapland, Inari boasts getting to see this wonder practically every night. You’ll Never Believe What This Family Saw in the Sky Outside Their House in Finland. Am I Dreaming? This Park Turns Into An Illuminated Forest At Night. This Little Known Place Way Up North Is Perfection. And I Had No Idea It Even Existed Til Now. Photographer Who Survived An Avalanche Goes On To Become National Geographic Adventurer Of The Year.